Amtrak has released Fiscal Year 2016 ridership totals for the Vermonter — and we are happy to report that ridership at stations in our region looks good overall. Ridership in Western Mass. increased 12% vs. FY 2015 — which is quite good considering that total Vermonter ridership was down 4% during the same period. Ridership in Western Mass. has increased 57% vs. FY 2014 — when the train was using the longer route via Amherst. Ridership from the four station stops in the Pioneer Valley now accounts for about 1/3rd of the total ridership on the Vermonter. It important note, when looking at the station totals in FY 2016 to FY 2015, that the FY 2015 numbers do not include a full year of ridership from most stations — so you can’t directly compare the change in station ridership year-over-year. One way to compare the station totals is to compare the FY 2016 totals with annualized totals for FY 2015. 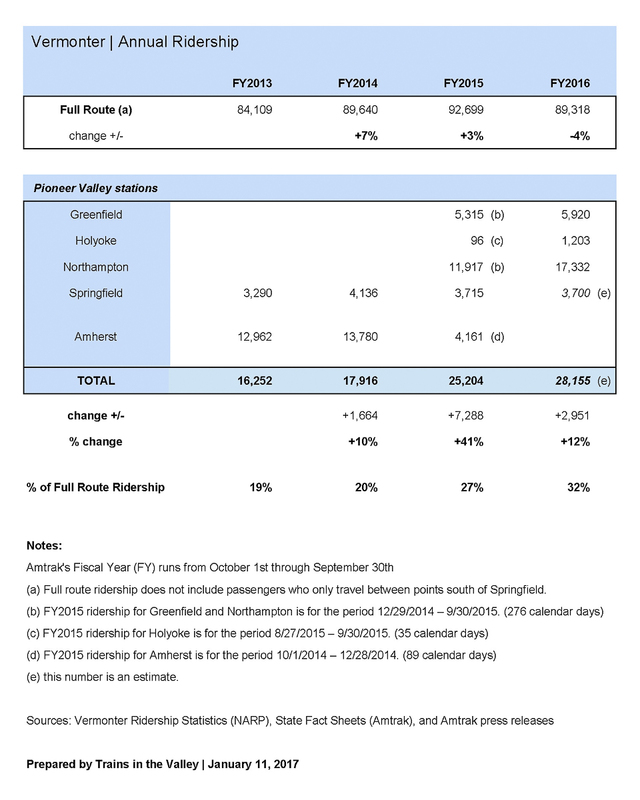 From other data, we know that the FY 2015 total for Greenfield included an unusually high number of passengers who traveled between Greenfield and Northampton or Springfield. We believe that most of these riders were just taking the train to try out the new routing of the Vermonter over the Connecticut River Line. Based on the available data, we believe that this is the only reason why the Greenfield ridership dropped from last year to this year. It would also be fair to say that the Holyoke increase of 20% may not be totally accurate since the number of days in FY 2015 with ridership in Holyoke was very small (just 35 days). To calculate an annualized number based on just 35 days of data may not yield a very accurate annualized total. Next year, when we have two full years of data to compare, it will be much easier to compare the changes in ridership at stations in the valley.